To Cite: Payandeh M, Amirifard N, Sadeghi E, Sadeghi M. Clinicopathology Illustration Treatment Options and Survival in the Patients with Testicular Germ Cell Tumors in Kermanshah Province, Iran, Int J Cancer Manag. 2017 ; 10(5):e4039. doi: 10.5812/ijcm.4039. Background: Testicular germ cell tumors (TGCTs) account for only 1% - 2% of all male neoplasma. Objectives: The aim of this study is to evaluate clinicopathological features, treatment options and overall survival (OS) in patients with TGCT in Kermanshah province, Iran. Methods: In this retrospective study, 39 patients that referred to oncology clinic in Kermanshah Province, Iran were included. All patients were diagnosed with TGCT between 2000 and 2014 and completed primary therapy (orchidectomy) than 37 patients was treated with chemotherapy and out of 37 patients, 9 patients were treated with radiotherapy in different parts of body (brain, mediastinal, or retro peritoneal). In the first diagnosis, serum tumor markers such as lactate dehydrogenase, α-fetoprotein, and human chorionic gonadotropin had been measured. Statistical analyses, survival and diagrams were performed using the SPSS 19, Prism and Excel 2007, respectively. Results: The mean age at diagnosis for the patients was 34.6 years (ranging 16 - 63 years). We divided the patients to two age groups, twenty-five (64.1%) were placed in age < 40 years group. Among nine metastatic patients, metastasis to brain, lung, kidney and lung + liver were 44.44%, 33.34%, 11.11 and 11.11%, respectively. The 5-year OS rate was 77.8%. Twenty-one patients had seminoma (53.8%) and 18 (46.2%) had non-seminoma. Conclusions: First of all, seminoma has a higher percentage in TGCT patients. Second, the mean age in TGCT patients is between 30 and 35 years. Third, in our study, brain metastasis had higher prevalence compared to other studies. At last, the OS in our study was similar to those of other studies. Testicular germ cell tumors (TGCTs) account for only 1% - 2% of all male neoplasma (1) and represent the model of a curable malignancy; sensitive tumor markers, accurate prognostic classification, logical series of management trials, and high cure rates in both seminomas and non-seminomas have enabled a framework of effective cancer therapy (2). TGCTs are classified into two groups: seminomas, comprised of the seminomas of the testis, and nonseminomas (3). Seminoma and non-seminomas are sub-classified into embryonal carcinoma, choriocarcinoma, yolk sac tumor, teratoma, and mixed germ cell tumors (4). The incidence of TGCTs increases shortly after the onset of puberty and peaks in the fourth decade of life with a median age of 34 years at diagnosis, and the incidence varies among different races and geographic locations. It is 5 times more frequent in white men compared with African American men. Among nations with the highest reported incidence are Scandinavia, Germany, and New Zealand (5). Adjuvant radiotherapy, single-agent carboplatin, or active surveillance can be applied following standard orchiectomy in TGCT patients (6). With modern therapeutic approaches, 5-year survival after the diagnosis of testicular cancer exceed 90% in many countries (7). Several prognostic factors of testicular cancers have been identified including histological group, extent of disease, and age at diagnosis. However, the independent prognostic relevance of these factors controlling for confounders has been disputed until recently (8). Testicular tumors spread is most common in lungs. Lung metastases may vary in appearance with respect to the histology of the primary tumor. Other sites of metastatic spread include the brain (most common in trophoblastic teratomas), bones and liver. Other sites of metastases, though rarely seen and usually only in the setting of advanced disease, include the adrenals, kidneys, spleen, pleura, pericardium, and peritoneum (9). The aim of this study is to evaluate clinicopathological features, treatment options and overall survival (OS) in patients with TGCT in Kermanshah province, Iran. In this retrospective study, 39 patients were included who referred to oncology clinic, Kermanshah province, Iran. All patients were diagnosed with TGCT between 2000 and 2014 who completed primary therapy (orchidectomy) than 37 patients was treated with chemotherapy and, 9 patients were treated with radiotherapy in different parts of body (brain, mediastinal, retro peritoneal) . 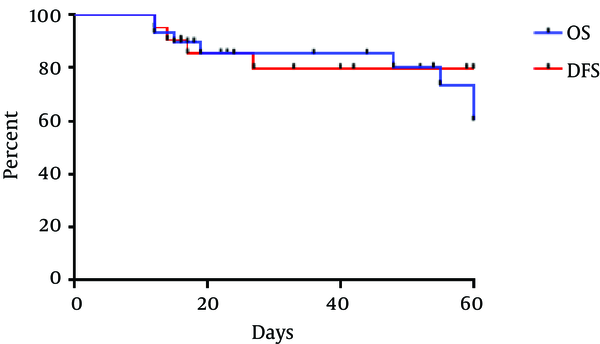 Patients received 3 cycles of PEB (cisplatin 20 mg/m2 IV on Days 1 - 5 and etoposide 100 mg/m2 IV on Days 1 - 5 as short infusions and bleomycin 30mg/day IV on Days 1,8, and 15 repeated every 21 days) and four relapse patients were treated with (paclitaxel 250 mg/m2 IV on Days 1 and ifosfamide 1500 mg/m2 IV on Days 2 - 5 and cisplatin 25 mg/m2 IV on Days 2 - 5 repeat every 21 days). Patients’ characteristics are presented in Table 1. Serum tumor markers such as lactate dehydrogenase (LDH), α-fetoprotein (AFP), and human chorionic gonadotropin β subunit (hCGβ) had been measured in the first diagnosis. The 5-year OS was measured in patients in a mean follow-up of 45 months (ranging 4 - 80 months) during which 12 patients lost the follow-up. Statistical analyses were conducted and diagrams were drawn using the IBM SPSS 19 and Excel 2007, respectively. The OS was calculated as the time from diagnosis to death or last contact. Curve of the OS was plotted by Kaplan-Meier plot in Graph Pad prism 5 Software in a five-year period with completing a 1-year period. The mean follow-up was 45 months (ranging from 4 to 80 months) during which 12 patients lost the follow-up and did not complete the 1-year period. Therefore, these patients were excluded from our study. Thirty-nine patients with TGCT were included in this study. The mean age at presentation was 34.6 years with a range of 16 to 63 years. When all patients were evaluated with respect to tumor localization, it was observed that tumors were located in right testis in 51.3% of the patients and in left testis in 48.7% of the patients. We divided the patients to two age groups twenty-five of which (64.1%) are placed in age < 40 years and fourteen (35.9%) in age ≥ 40 years. Among nine metastatic patients, 4 (44.4%) had brain metastasis, 3 (33.4%) had lung metastasis and 2 (22.2%) had kidney metastasis (Table 1). 21 patients had seminoma (53.8%) and 18 (46.2%) had non-seminoma. aMean ± SD (Min - Max) = 34.6 ± 12.97 (16 - 63). bbleomycin + etoposide + cisplatin. cpaclitaxel + ifosfamide + cisplatin. The Table 2 shows the mean amount of tumor markers in patients with TGCT. All amounts are very higher than normal. Abbreviations: AFP, alphafetoprotein, HCG, human chorionic gonadotropin, LDH, Lactate dehydrogenase. 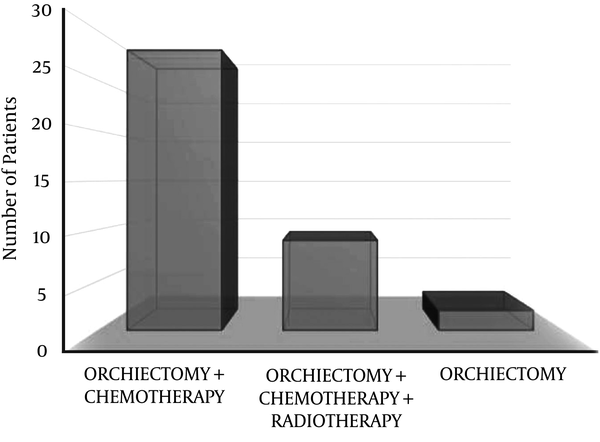 Twenty-eight patients (71.8%) were treated with orchiectomy and chemotherapy, 9 (23.1%) with orchiectomy, chemotherapy and radiotherapy and 2 (5.1%) with orchiectomy alone (Figure 1). The 5-year OS rate and DFS (disease free survival) rate of all TGCT patients were 77.8% and 81%, respectively (Figure 2). TGCT is the most common malignant tumor in young men (10). A study on epidemiology of TGCT showed that seminoma was the most common testicular cancer in majority of countries with tumor registries (11). Among TGCT patients, 50% were seminomatous tumors, 48% non-seminomatous tumors and 2% were spermatocytic seminomas (12). In our study, 53.8% patients were seminoma (53.8%) and 46.2% had non-seminoma. Therefore, based on these results, seminomatous tumors are more than non-seminomatous tumors in TGCT patients. TGCTs are the most frequent solid malignant tumors in men 20 - 40 years of age and the most frequent cause of death from solid tumors in this age group (13). In a study, the mean age for TGCT patients was 33 years (14). Assi et al. (12) reported that the mean age for testicular tumors was 32 years. The mean age in our patients was 34.6 years with the highest frequency in ages < 40 years. Therefore, TGCT happens more in young adults and the mean age in TGCT patients is between 30 - 35 years. Although the GCTs are highly treatable diseases with platinum based combination regimens, cure cannot be achieved in 20% - 30% of patients with advanced disease with first line chemotherapy (15). Chemotherapy is the treatment of choice for patients with bulky retroperitoneal involvement and all stage III cases result in a complete response rate of approximately 90% (16). Adjuvant radiotherapy is frequently used with a relatively encouraging outcome as relapse rates of 3% - 4% (4). Presence of rete testis invasion has been associated with post-orchiectomy relapse in patients with early stage GCTs (17). Although it has been shown recently that radiotherapy does not increase cardiovascular morbidity (6). Orchidectomy is curative in many early stage testicular cancers. The introduction of platinum-based chemotherapy in the late 1970s dramatically improved the outcome for patients with metastatic disease (18). Orchidectomy in GCT patient is the first plan in most of them for diagnosis and treatment, and in most patients it had been done by urologists then patients were referred to oncologist for continuing the treatment. In early stages, it is possible for patient not to need any therapy despite orchidectomy but most patients with advanced stages need other treatments most common of which is chemotherapy. A few groups of patients need irradiation in different parts of the body (brain, mediastinal, retro peritoneal) for completion of treatment (16). In young Turkish patients with TGCT, good results were obtained with appropriate treatment. Most patients were treated with chemotherapy and the prognosis of the disease was good even in the advanced stages. However, larger-scale studies with longer follow up are needed to reliably obtain long-term survival data of these patients (19). A study (20) reported that the 5-year OS of poor-prognosis testicular non-seminomatous germ cell tumor patients reached 83% and in other studies the rate was 74% (21) and 73.5% (22). In our study, the 5-year OS was 77.8% that was close to other studies. Also, more patients were treated with orchiectomy plus chemotherapy and 9 patients with metastasis were treated with combination of orchiectomy, chemotherapy and radiotherapy that caused the OS to grow higher than a number of previous studies. Therefore, the combination of orchiectomy and chemotherapy can be a good treatment for all TGCT patients. Brain metastases of testicular germ cell tumor (TGCT) are rare events (23, 24) and occur in approximately 10% of patients with advanced metastatic germ cell tumors (25). In our study, out of 9 metastatic TGCT patients, 44 patients (44.4%) had brain metastases. These results show that metastasis to brain is not rare in our area. For good results, it needs more research with bigger sample size population of patients in the West of Iran. About tumor size, it is necessary for pathology (26) and should be listed in the articles but based on our information, researchers have not reported information on tumor size completely as in breast cancer. In patients with testicular germ cell tumors, determination of both hCG and AFP is mandatory for the diagnosis and the follow-up under treatment (27). Also, LDH is significantly elevated, especially in the presence of advanced tumors (27). AFP may be raised in 50% - 70% and hCG in 40% - 90% patients with non-seminomatous GCT (28). Although these markers are important and effective in identifying the type of treatment for patients but in our study, because of the low population of patients, we were not able to analyze these markers completely based on subtypes and other variables but in our future study, we will run this analysis. In summary, the number of patients with metastasis, type of metastasis, size of tumor, age, type of treatment can be effective in survival. To achieve better results, it is necessary to conduct researches with more patients. First of all, seminoma has higher percentage in TGCT patients. Second, the mean age in TGCT patients is between 30 - 35 years. Third, in our study, brain metastasis had higher prevalence compared to other studies. At last, the OS in our study was similar to other studies but for reaching better results, we need more research about TGCT with more patients and emphasis on kind of treatment in Iran especially in the West.